Regular readers of this blog may have noticed that my posts have been less frequent in the past year. In lieu of my usual holiday “snailmail” letter, here’s an update. Late 2014 turned out to be difficult. Janice and I traveled to Pennsylvania and New York City to visit an ailing uncle of hers and our college friend Steve A.L., respectively. Both of them died, so we drove back down to their funerals. Mike H., the manager of the Compleat Strategist in Boston, also died, joining Robert A.S. and other role-playing friends whom we lost in the past few years. After the usual holiday travel to see our families in Upstate New York and Virginia, Janice and I got sick in early January 2015, followed by a very snowy winter in the U.S. Northeast. I then changed jobs in March 2015 (Janice had changed technical writer positions in September 2014). This has been the main thing keeping me from blogging. After about six years as an editor managing a TT site about Windows enterprise desktops, I began working at EH/RBR as a writer covering robots. My former colleagues gave me a very nice going-away party, and a few have stayed in touch, joining former co-workers from BNA and IDG/CW. Robotics has been an interesting beat, as I’ve learned a lot by trying to keep up with the business news around this rapidly developing technology. I’ve also had the good fortune to travel to events in Milan, Italy; San Jose, Calif., and soon, the annual Consumer Electronics Show in Las Vegas. In the coming months, I may also get to travel to Canada, Denmark, and Lithuania for work. While I don’t particularly enjoy spending time in airports or cramped airplane seats, any chance to see the world, meet new people, and eat new food is a good one! I got to tag along with Janice to Limerick, Ireland, and we really liked exploring the Cliffs of Moher, various castles, and the beautiful countryside. Janice and I have also returned to regular arts fairs such as the Lowell Folk Festival and the Christmas Revels. In the meantime, Janice and I have kept busy, hosting college pal David I.S. & Sandra K. for last New Year’s and the wedding reception of mutual friends Thomas K.Y. & Kai-Yin H.
We also hosted her family for Easter and her 50th birthday, grad school chum Erik B.L. 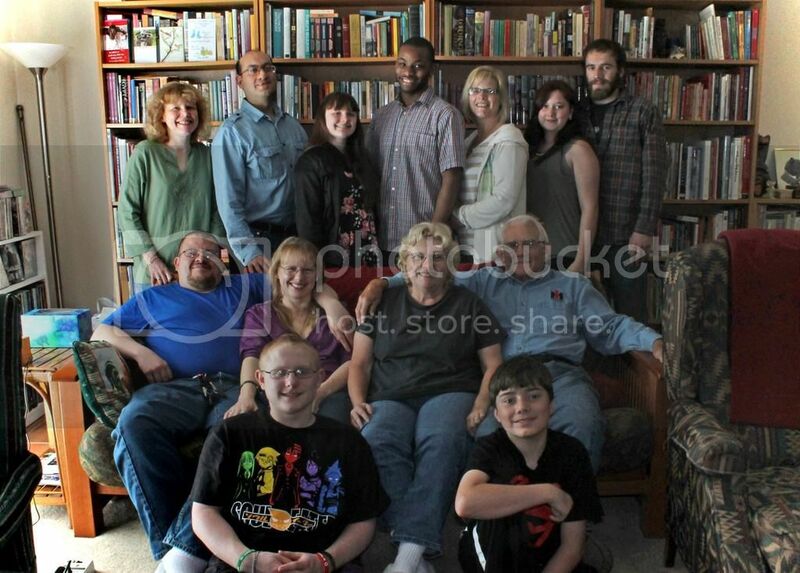 and his family, and St. Louis-based gamer Byron V.O., who may be visiting again later this month. In late August, we met my family in Ogunquit, Maine, to celebrate my mother’s 85th birthday, my father’s 80th birthday, and Janice’s and my 20th wedding anniversary. So many milestones! I also attended genre entertainment conventions including Anime Boston, the Tampa Bay Area Renaissance Festival, the Watch City Steampunk Festival, the Boston Comic Con, and the Rhode Island Comic Con. All of them had the usual cosplayers, fun panels and autograph sessions with celebrities, and tempting artist and vendor booths. We recently spent Christmas at my brother and his family’s new house in Northern Virginia, and we met some friends in Westchester, N.Y., on the way home. Some of us have started planning reunion gatherings to celebrate the 30 years since we graduated from high school and began college. Three nights a week, I’ve continued my role-playing games and historical weapons classes. My D20/FATE “Vanished Lands” fantasy campaign has given way to two adventuring parties using Dungeons & Dragons Fifth Edition (D&D5e). Fellow Game Master Jason E.R.’s “Star Wars: Dark Times” scenario (using Savage Worlds) just ended its latest chapter, and we’re about to start Bruce K.’s D&D5e “Kings and Pawns” space opera miniseries. The latest “episodes” of my D20/FATE “Star Trek: Restoration” game also went well. Speaking of ongoing series, I’ve been enjoying the latest wave of fantasy, horror, superhero, and science fiction shows on television (more on that to come). I saw fewer movies in theaters in 2015 than in previous years, but I’ve gotten pickier, and time has been limited. I’ve also been reading several SF magazines and Web sites, assorted pulp comic books, and various novels (mainly with the “Escapists” book club). So much to do, so little time! I’ll try to post more specific reviews in the coming year, and I wish all of you a healthy, peaceful, and Happy New Year! I’ve fallen behind in blogging again because of travel over the past month, the holidays, and being ill. Fortunately, I have no shortage of topics to write about! Last week, David I.S. & Sandra K. drove from Rochester, N.Y., to visit Janice and me in Waltham, Mass. Dave was the very first friend I made at college, and our New Year’s celebrations have become something of a tradition. On Tuesday, 30 December 2014, Thomas K.Y. & Kai-Yin H. and Thomas’ brother Tony joined us for a potluck dinner and fun conversation. On New Year’s Eve, we took it easy because Dave & Sandra were suffering from bad colds (that Janice and I later caught). On New Year’s Day, Janice, Dave, and I went to the AMC Burlington Cinema 10 for a 3-D matinee of The Hobbit [Part 3 of 3]: The Battle of the Five Armies. We mostly enjoyed the finale of Peter Jackson’s adaptations of J.R.R. Tolkien’s seminal fantasy novels. As with the previous installments, An Unexpected Journey and The Desolation of Smaug, it’s assumed that viewers are at least passingly familiar with Tolkien’s Middle Earth and Jackson’s films for The Lord of the Rings trilogy. In addition, the audience should have seen the first two Hobbit movies (even more than read the relatively brief children’s book) before watching Battle of the Five Armies. The Wizard Gandalf has sent Hobbit Bilbo Baggins across the dangerous wilderness with a band of 13 Dwarves to help them reclaim their treasure and lost homeland from the fierce dragon Smaug. On the way to Erebor, the Lonely Mountain, they encountered vile Goblins, haughty Elves, various monsters, and the scruffy humans of Lake Town. Once Smaug is awakened from his slumber by Bilbo and company, the angry dragon incinerates Lake Town. Only the human Bard the Bowman is brave enough to face down the huge beast, even as Orcs and Elves rouse troops to wrest control of its hoard at Erebor. Meanwhile, to the south of Mirkwood in the ruined fortress of Dol Goldur, the White Council finds the Necromancer, who is revealed to be the evil Sauron. Gandalf, Elven nobles Elrond and Galadriel, and the Wizard Saruman the White fight the incorporeal Sauron and his nine Nazgul, the spirits of corrupted human kings. Can Bilbo find a way to keep Thorin’s lust for treasure from getting their company killed? Can Gandalf and the White Council defeat Sauron? Can Dwarves, humans, and Elves put aside their differences long enough to deal with the Orc hordes, and what casualties will result from the battle? If you’ve read the book or noticed any of the foreshadowing in the previous Hobbit movies, you’ll know. There are no major additions in this movie, but there were a few good moments for Sherlock‘s Martin Freeman as good-hearted burglar Bilbo, Robin Hood‘s Richard Armitage as proud Thorin, and Pushing Daisies‘ Lee Pace as isolationist Thranduil. As before, Bilbo’s scenes are closest to those in the book, and I even began to feel sympathy for elk-riding Thranduil. I would have liked Thorin’s “gold sickness” be more of an opportunity for the other Dwarves to react than an explicit echo of Smaug’s words. With three long movies’ worth of screen time, there should have been more character development for all 13 Dwarves. While I approve the addition of Lost‘s Evangeline Lilly as Tauriel in a male-heavy cast, I would have preferred less of a forced love triangle with her, Orlando Bloom’s ageless Legolas, and Being Human‘s Aidan Turner’s young Dwarf Fili. I understand that the slapstick scenes with Stephen Fry as the Master of Laketown and Ryan Gage as his slimy assistant Alfrid were meant to contrast with the virtue and courage of Luke Evans’ Bard, but they were a bit too broad for my taste. Of course, they wouldn’t be out of place during most fantasy tabletop games. Spartacus and Arrow‘s Manu Bennett (whom I’ve met) and John Tui remained menacing as Orc chieftains Azog and Bolg — mostly through motion capture, I assume. Busy Benedict Cumberbatch had less voice time as the Necromancer and Smaug this time around. It was nice to again see Ian McKellen as Gandalf, Christopher Lee as Sauruman, Cate Blanchett as Galadriel, and Hugo Weaving as Elrond. The narrative framing device bringing back Ian Holm as old Bilbo was an even better tie-in to Fellowship of the Ring. Because of the focus on the big set-piece battles, the pacing of Battle of the Five Armies seemed a bit smoother than in its predecessors. Smaug’s raid is rather short, and the evacuation of Lake Town and Dale by humans ahead of marauding Orcs is overly similar to Helm’s Deep in The Two Towers. A combat between Thorin and Azog (rather than Bolg, as in the book) takes place on a frozen waterfall. As much as I liked 2004’s King Arthur and Battle of the Five Armies, I wish filmmakers would stop copying Alexander Nevsky‘s ice battle, which is based on real history. Like his distinguished peers George Lucas, James Cameron, and Ridley Scott, director Peter Jackson has let technology overwhelm his sense of storytelling in this second trilogy. A good editor should be able to tell even established filmmakers when certain scenes go too long. Just because one can now realize a grand vision, if it doesn’t help the characters, setting, or plot, it doesn’t need to be included. Perhaps some of the focus will be restored in the inevitable director’s cuts on DVD and Blu-ray. I also wonder how Guillermo del Toro might have handled the same material in less time, without franchise pressure from Warner Bros.
As noted above, the dragon, Orcs, and landscapes were all brought to spectacular life by WETA Studios. I noticed the computer-generated imagery less this time around, and 3-D worked fine for us (we didn’t find an IMAX showtime we liked). I do wonder what Battle of the Five Armies might look like at high frame rate. Thranduil’s Wood Elves were too much like the shining hosts of the Second Age or the Sindarin of Lothlorien. Legolas’ gratuitous acrobatics, which have become a cliché since the Lord of the Rings movies, reminded me of why some role-players hated the smug, omnipotent Elves of the AD&D2 era. Also, I would have liked to see more than telekinesis or blasts of wind during the White Council’s battle against Sauron. On the other hand, most magic in Tolkien’s books is more subtle than the pyrotechnics jaded audiences have come to expect. Once the Goblins and Dwarves met in battle, it was hard to tell them apart, despite their difference in size (and we saw it in 3-D). I would have given each army more different armor or colorful surcoats. The overhead shots still felt too much like a video game. The music served the story, but the themes that we noticed most were those that harked back to The Lord of the Rings. The fine art by Alan Lee and John How during the closing credits was well accompanied by “The Last Goodbye,” sung by Billy Boyd (Pippin in the first film trilogy, which takes place after The Hobbit). Overall, I’d give The Hobbit: The Battle of the Five Armies, which is rated PG-13 for violence, a B, 7.5 out of 10, or three and a half out of five stars. Despite some problems, the movie does tie up the prequel trilogy and shows the climactic battle for northern Middle Earth. That said, I hope that filmmakers leave Tolkien’s work alone for a while before taking a fresh look at The Hobbit or parts of the Silmarillion. Jackson’s Lord of the Rings adaptation is the stronger work, and unlikely to be equaled anytime soon. Back at home, Dave, Sandra, Janice, and I also enjoyed The Edge of Tomorrow, a decent Tom Cruise vehicle that was indeed a mashup of military science fiction Starship Troopers and time-travel Groundhog Day. We also later returned to Burlington for dinner at the busy Border Café, one of our favorite local Tex-Mex eateries. Janice and I didn’t come down with our colds until after Dave and Sandra left (taking more of my comic book collection with them for storage), but we had a nice time around the holidays. Now, just to shake it while getting back to work! Posted on January 8, 2015 by GeneD5Posted in Fantasy & Steampunk, Food, Holiday, MoviesTagged Battle of the Five Armies, hobbit, J.R.R. Tolkien, Lord of the Rings, Middle Earth, peter jackson, review. 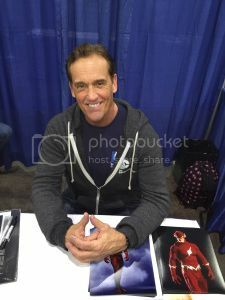 This past weekend, Janice and I drove down to Providence for the Rhode Island Comic Con (RICC). 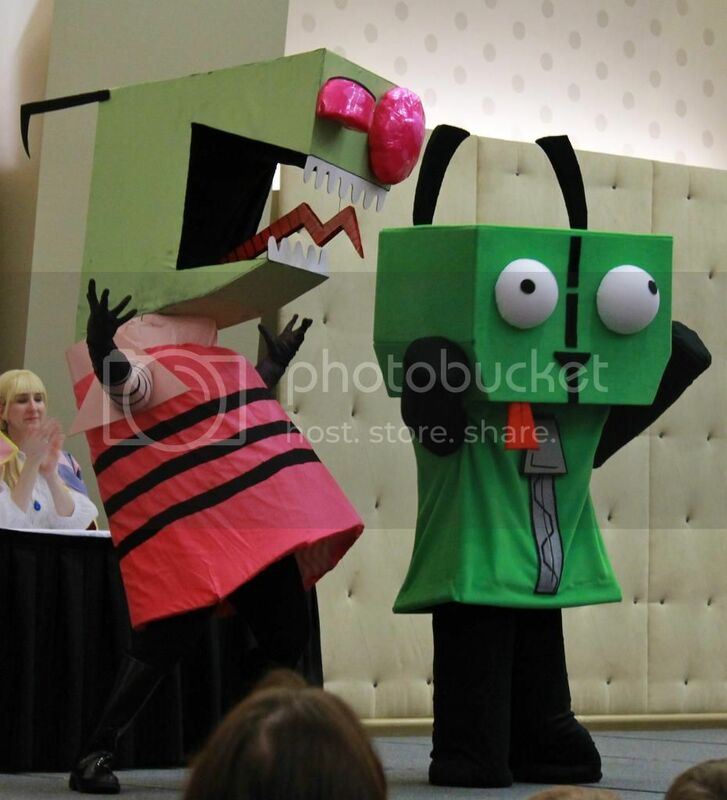 Despite the ever-growing crowds, we enjoyed the latest genre entertainment convention. In addition to seasonal arts and crafts festivals, I usually try to get to some of the local events featuring TV and movies, comic books, and games each year. Because of family-related travel, I ended up skipping this year’s Boston Comic Con, the huge New York Comic Con, and the upcoming Super MegaFest, as well as various Renaissance festivals. I’ll write more about other recent cons soon, but back to Providence. Janice and I tried to get to the convention center early, and we had to wait outside for two hours in various lines before we finally got on the right one for our wristbands and admission. 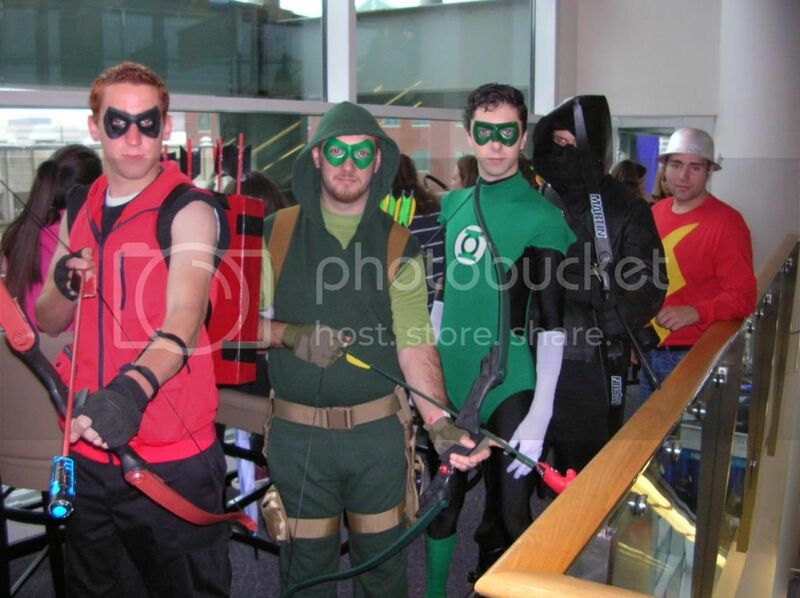 As with last year’s Boston Comic Con, it might have been easier to get in without advance tickets. At least it was raining only lightly rather than snowing as in Massachusetts, and the cold I’ve been fighting was manageable. I felt particularly bad for the underdressed cosplayers shivering farther back in line. Extra layers or overcoats never hurt, at least until we get inside (Janice and I ran ours back to my car once we got in). All of the events I’ve attended in the past few years have struggled with growing attendance. While I’m glad to see a new, more diverse generation of fans sharing some of my interests, organizers and venues have yet to catch up. Vendors can’t sell things if people can’t get to their tables or booths, and fans excited to meet artists or actors come away with negative feelings about communal experiences. According to people I talked with, the Rhode Island Convention Center can hold up to about 10,000 people at a time, and the RICC had to turn people away by Saturday afternoon after 20,000 showed up. If a total of 17,000 people attended last year, it was a mistake to plan for 50,000 over the course of this weekend. Understandably, many people were very unhappy, but I hope that everyone can learn better logistics for the sake of safety and fun. What should organizers do? I recommend planning for more frequent events, finding larger venues if possible, and making the events more specific — just pop-culture celebrities or graphic artists, for example. If nearly every state in the U.S. has a Renaissance festival or two, some of the pressure could be relieved with more numerous, local shows. Once we got into the RICC, it was crowded but worthwhile. There were many celebrity guests, including the original Star Trek‘s William Shatner, George Takei, Nichelle Nichols, and Walter Koenig. I had seen these actors before, but it was Janice’s first time to see them in person. 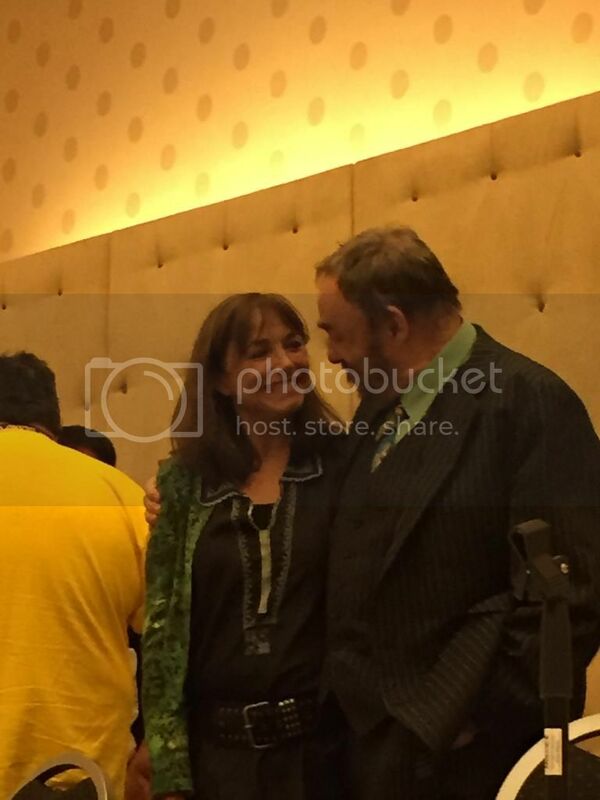 We also got to chat with John Rhys-Davies and Karen Allen from the Indiana Jones movies, former Doctor Who Colin Baker, and The Flash‘s John Wesley Shipp. All were very gracious and took the time to speak with each autograph seeker. 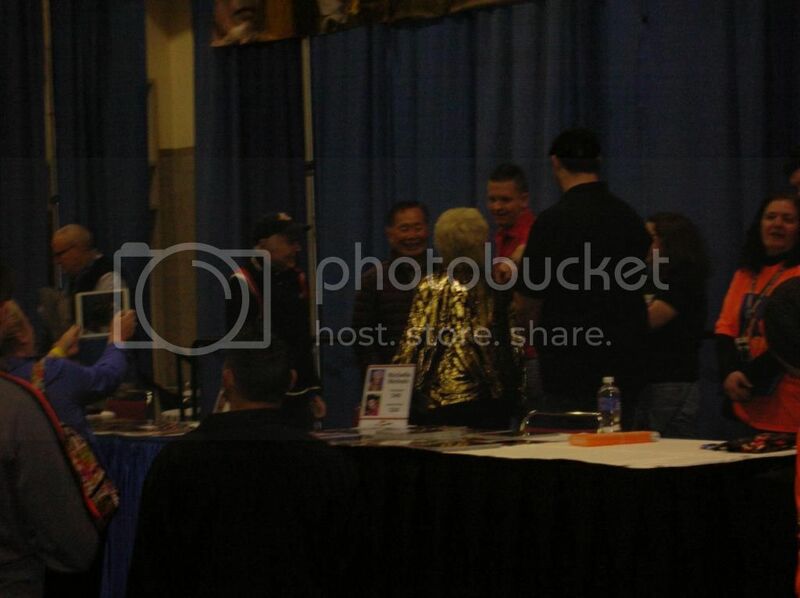 At last year’s RICC, I got to hang out with both Buck Rogers and Flash Gordon — Gil Gerard and Sam Jones! 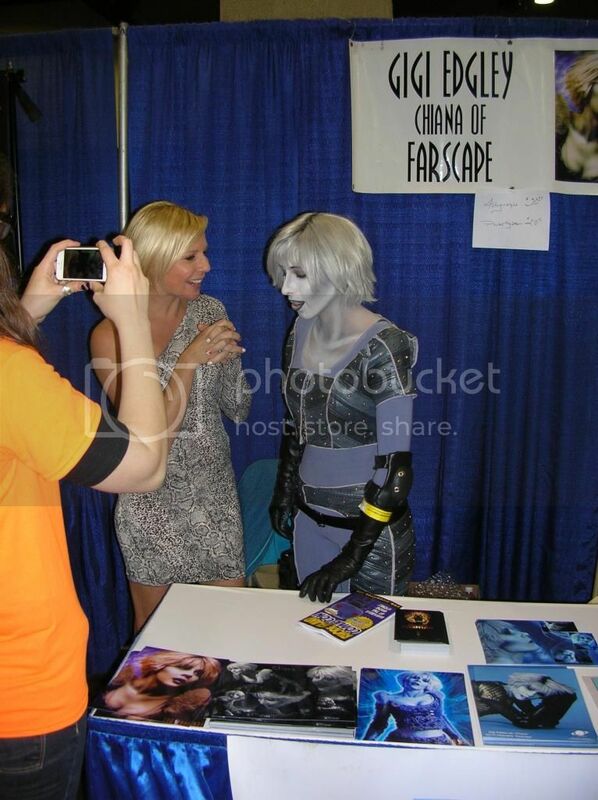 This year, Farscape‘s Gigi Edgley complimented Janice’s and my “positive energy,” and “Whedonverse” (and Agents of SHIELD) alumnus J. August Richards was much more pleasant than his tortured characters. I’m friends with Jacqui B., who runs his and others’ Web sites. We browsed the vendor area and walked through Artist’s Alley, which included luminaries such as Neal Adams, Jim Steranko, and Bob Eggleton. I bought sketchbooks from Michael Dooney and Chrissie Zullo. As collectible card games and video games have displaced tabletop role-playing games, anime seems to be more popular among many younger consumers and cosplayers than traditional superhero comics. The acting was solid, with Mignogna as Capt. James T. Kirk, Mythbusters‘ Grant Imahara as Lt. Hikaru Sulu, and Chris Doohan a dead ringer for his late father James as chief engineer Scotty. Asia De Marcos is also a strong reflection (sorry, couldn’t help it) of BarBara Luna as Marlena Moreau, the “captain’s woman.” Michael Dorn provided the computer voice for the alternate universe’s Enterprise. For any fan of classic Trek, this is more true to Gene Roddenberry’s idealistic space opera than many of its subsequent spin-offs and certainly more so than J.J. Abrams’ reboot. We missed Shatner’s panel, but we did catch a brief one with Nichols and Koenig in which they reminisced as the franchise approaches its 50th anniversary. 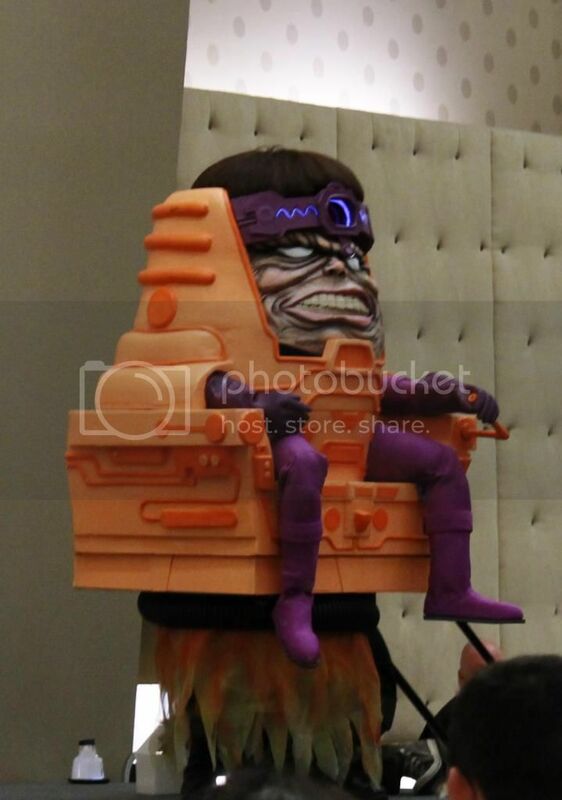 Janice and I sat through part of the costume contest — my favorites included characters from Invader Zim and Marvel’s Modok — but we eventually left to eat. Not surprisingly, most of the restaurants in the adjacent Providence Place Mall were full, so we ended up grabbing dinner at Panera before checking into the comfortable Hampton Inn & Suites Downtown. We had better luck than actress Eliza Dushku, who was robbed, but all’s well that ends well…. I’ll post soon about our second day at the con! Posted on November 9, 2014 by GeneD5Posted in Comic books & superheroes, Fantasy & Steampunk, Food, Movies, Speculative Fiction, Television, TravelTagged 2014, convention, report, Rhode Island Comic Con, RICC, star trek. On Saturday, 18 October 2014, Janice and I went to the AMC Burlington Cinema 10 for an early matinee of The Book of Life. We enjoyed the movie, which is the latest in a strong year for animation. Plot: The Book of Life begins in a modern-day museum as a clever guide gives a bunch of bored schoolchildren are some insight into Mexican lore. The story then shifts to puppet-like characters in a tale full of swashbuckling romance and otherworldly adventures. Manolo, Maria, and Joaquin are three young friends in the village of San Angel, but they are driven apart by their parents’ expectations and two meddling immortals, La Muerte, ruler of the Land of the Remembered, and Xibalba, ruler of the Land of the Forgotten. Reunited as adults, matador Manolo would rather be a musician, and Joaquin is a decorated soldier, as was his late father. Maria returns from Spain and is wooed by both Manolo and Joaquin, but Xibalba’s schemes and vicious bandit leader Chakal send Manolo on a quest through the lands of the Remembered and Forgotten…. Cast: The summary above doesn’t do justice to The Book of Life‘s twists, colorful visuals, and strong acting. Diego Luna is properly soulful as Manolo (reminding me of Antonio Banderas), and Channing Tatum plays on his image as good-natured hunk Joaquin (not unlike Kevin Kline). Zoe Saldana is spunky as Maria, who refuses to be the passive object of the two guys’ affections and rallies San Angel against Chakal’s horde. They are supported by experienced voice actors Kate del Castillo as seductive La Muerte, Ron Perlman as fearsome Xibalba, and Hector Elizondo as Manolo’s bullfighter father Carlos Sanchez. In addition, Christina Applegate plays the museum docent Mary Beth, Ice Cube is the benevolent Candle Maker, and other characters are voiced by Danny Trejo, Cheech Marin, and even opera singer Placido Domingo. There is some slapstick, but nothing really offensive. Direction: Jorge Gutierrez does a decent job of pacing, from the initial prologue through Manolo’s eye-popping arrival in the Land of the Remembered through his more conventional final confrontations with Joaquin and Chakal. Since Guillermo del Toro was a producer, it’s no surprise that the expansive scale, Mexican mythology, and emotional heart of The Book of Life are so well-handled. I was interested to see mentions of feminist and animal-rights ideas balanced against elements harking back to ancient Mesoamerica and even Greece and Rome. Death is shown as not something to be feared, but as part of life. True heroism requires sacrifice, and respect for family and true love still conquer all. None of these messages come as any surprise, but they are delivered in a piñata of action. The inventive character designs and divergent settings (San Angel and the lands of the Remembered and the Forgotten) are still impressive in an era when we’ve gotten used to hyper-realism or highly stylized computer and stop-motion animation. 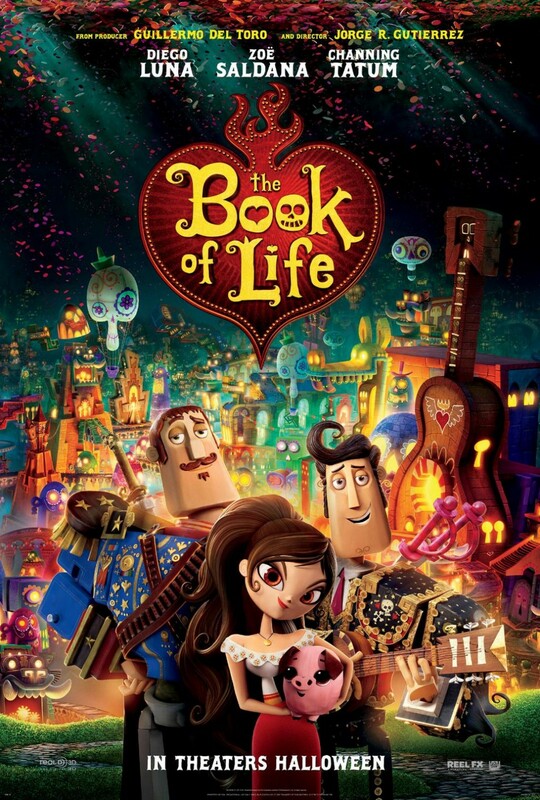 Soundtrack: The music of The Book of Life is a great blend of Latin, classical, and pop tunes. Normally, I wouldn’t like the inclusion of the latter, but all three styles manage to help both the humor and romance of this movie. Rating: The Book of Life is rated PG for rude humor and scary images. I’d give it an 8.5 to 9 out of 10, four out of five stars, or an A-. I liked it slightly more than The Boxtrolls and close to The Lego Movie. I’d strongly recommend The Book of Life to anyone who’s young at heart. After the movie, Janice and I went to the Tex-Mex Border Café for lunch. (We also had Besito and Chipotle as options nearby.) I hope to eventually catch The Tale of the Princess Kaguya, which is in limited release, and Big Hero 6. Posted on October 19, 2014 by GeneD5Posted in Fantasy & Steampunk, Food, MoviesTagged animation, review, The Book of Life. On Saturday, 27 September 2014, Janice and I met newlyweds Thomas K.Y. and Kai-Yin H. at the refurbished AMC Burlington 10 multiplex for The Boxtrolls. We enjoyed the stop-motion fantasy film. Plot: The Boxtrolls opens with what looks like a child being abducted by monsters in the teetering town of Cheesebridge. However, viewers soon learn that the Boxtrolls, so named because they wear discarded cardboard boxes, are not malicious, merely subterranean scavengers and grotesque goblins. The child becomes a boy named Egg (for the box he threatens to outgrow), even as Archibald Snatcher uses the supposed abduction to whip up hysteria to further his own nefarious ambitions. Unfortunately, the villain is allergic to cheese even as he years to join the town’s “white hats,” or cheese-tasting ruling council (reminding me of the inventor in Aardman’s Wallace and Gromit series). As more and more Boxtrolls are captured by Snatcher’s dimwitted henchmen, Eggs encounters a girl, Winnie, the daughter of mayor Lord Portley-Rind. She helps him understand the human world, fight Snatcher, and learn about the true circumstances of his kidnapping. Cast: The colorful characters, whose names could be from a Dickensian or Harry Potter novel, are voiced by a strong mostly British cast. Isaac Hempstead-Wright plays courageous Egg, and Elle Fanning is the plucky Winnie. Ben Kingsley is the loathsome Archibald Snatcher, who sometimes disguises himself as a woman in an attempt to infiltrate Cheesebridge’s high society. His henchmen, the large Mr. Trout, the self-doubting Mr. Pickles, and the pugnacious Mr. Gristle, are played by Nick Frost (The World’s End), Richard Ayoade (The IT Crowd), and Tracy Morgan (30 Rock), respectively. Jared Harris (Sherlock Holmes: A Game of Shadows, Fringe) isLord Portly-Rind. None of the actors was particularly recognizable in their roles, but all gave expressive performances matched by their cartoonish avatars. Direction: The Boxtrolls, which is based on Here Be Monsters! By Alan Snow, was directed by Graham Annable and Anthony Stacchi. They do a good job of juggling action, physical and verbal comedy, and pathos with an absurdist tone with some social commentary — some critics have noticed the strong resemblance between Cheesebridge and Terry Gilliam’s dystopian fantasies. Cinematography: As one might expect from Laika, the animation studio that produced Coraline and ParaNorman, the stop-motion is excellent, with 3-D printed faces and light computer-enhanced imagery making this one of the smoothest and most baroque-looking films of its type so far. I liked the environment and character designs, which are reminiscent of Tim Burton’s Nightmare Before Christmas or The Pirates! Band of Misfits without being derivative. The closing credits give some insight into the laborious process. The Boxtrolls‘ Rube Goldberg inventions, including Snatcher’s steampunk menace, are fun to watch. Rating: The Boxtrolls is rated PG for some gross humor and scenes of peril. While I agree that the story for The Boxtrolls isn’t as tight or as clever as that of Coraline or ParaNorman, I’d still compare it favorably with most of the genre. I’d put it slightly below The Lego Movie as my favorite animated movie of the year so far, at a 7.5 or 8 out of 10, a B+/A-, or four out of five stars. 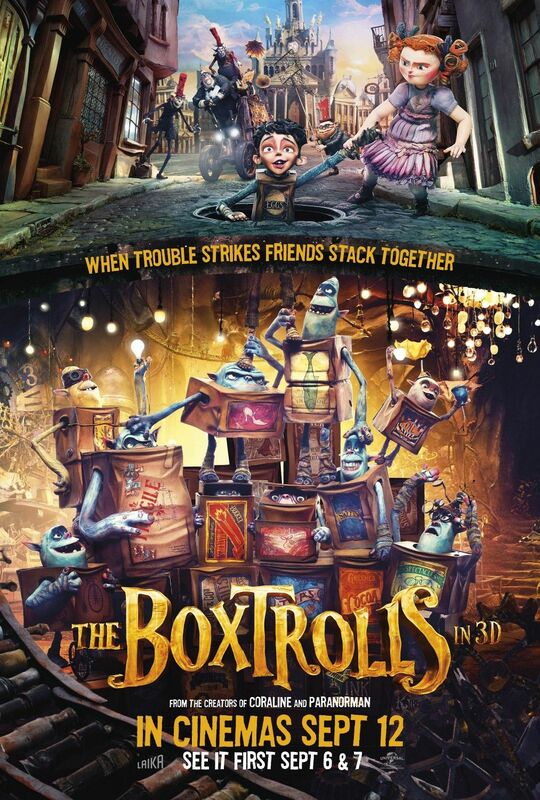 I’d definitely recommend The Boxtrolls to fans of British humor and animation. One of the films I’d like to catch next in the theater is The Book of Life, which is computer-animated rather than stop-motion, but it still looks bright and fun. After the movie, we went to Besito, a new Mexican restaurant in the Burlington Mall that we all liked. Also this past weekend, Janice and I walked the Minuteman Trail in Lexington, Mass. I know I’m behind on reporting on conventions, seasonal festivals, and more, but I’ll try to catch up, even as the new genre television season begins!